Be seen and INVUE with the Class 2 Flame Retardant 2-Tone Vest. 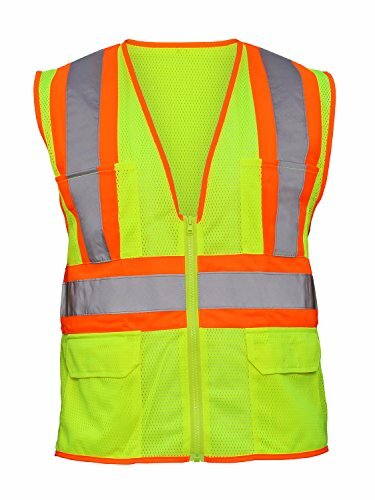 Made with 100% polyester mesh, 2" wide reflective tape with two-tone contrast trim, flame retardant treated fabric and front molded plastic zipper closure that matches vest color. Includes 2-front chest pockets, 2-hip pockets and 2 inner pockets. ANSI/ISEA 107 Class 2 compliant. Class 2 is for workers who work near roadways where traffic exceeds 25 mph and workers who need greater visibility in inclement weather; generally includes school crossing guards, parking and toll gate personnel, airport ground crews and law enforcement personnel directing traffic. For over 30 years, SAS Safety Corporation has provided safety products and equipment designed to make workplaces safer. We are dedicated to providing quality products that protect and preserve our most valuable resource: people. We offer a complete line of personal protective equipment; eye and face, hand, body, respiratory and hearing protection, as well as first-aid kits, ergonomic, spill control, and traffic safety products.